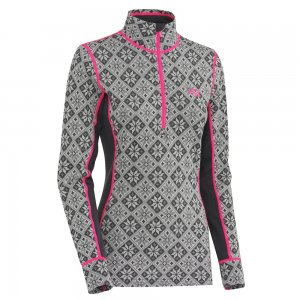 The Kari Traa Kroll half-zip long underwear top is a warm and functional base layer for high-energy winter activities. The merino wool blend is naturally odor resistant, wicking and breathable. With beautifully detailed patterning and soft merino wool, this base layer top is cute, classic and perfect for cold-weather activities. The high neck and half-zipper let you bundle up or air out. With beautifully detailed patterning and soft merino wool, these base layer bottoms are cute, classic and perfect for cold-weather activities. An icon of the Scandinavian winter, the Kari Traa Rose hooded base layer provides maximum warmth and is perfect for layering up on cold days. Lightweight and incredibly soft, the Kari Traa Tikse long underwear bottoms give a boost of warmth during cool-weather activities thanks to ultrafine, 4-way stretch merino wool. Lightweight and incredibly soft, the Kari Traa Tikse long underwear top is an ultrafine merino wool base layer that offers a boost of warmth during cool weather activities. Add a layer of warmth when bundling up during cold weather with the Kari Traa Ulla half-zip women's long underwear top. These warm merino wool bottoms are soft on your skin, breathable and naturally odor-resistant, perfect for cold-weather sports and outdoor activities. This warm merino wool base layer is soft on your skin, breathable and naturally odor-resistant, making it perfect for cold-weather sports and outdoor activities.